Gosport & Fareham are in a positive mood as they visit Eastleigh in London two south west on Saturday (3pm). Despite losing their opening game at Old Emanuel the Blue & Golds felt there were lots of positives to take from it. Coach George Hillan is confident his side can bounce back. He said: ‘It has been a week of consolidation for the players and coaching staff, while trying to get over the disappointment of the defeat. ‘After watching the video of the game the players have identified the areas they need to develop. ‘The ability for the players to carry out self analysis is a new concept we have brought in this season and already we can see the benefits. ‘From a coaching perspective it was very pleasing to see we are all aligned with the players, identifying the same areas as the coaching staff. ‘This means we can go forward as a collective. ‘We are under no illusion this weekend’s fixture will be a very hard one as Eastleigh are coming off a convincing win away last weekend. ‘Training has been focused on the areas we identified we need to develop and has been very productive. ‘Selection this week has been hard and it’s been about trying to find the right balance for the team without affecting players’ confidence. Fareham Heathens host Sandown & Shanklin, looking to build on their winning start in the Hampshire League premier division. 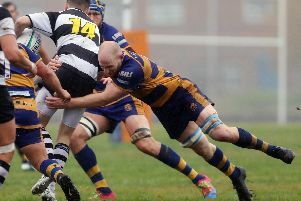 Coach Dave Wheaton is looking to get one over the Isle of Wight side on Saturday. He said: ‘We haven't beaten the Hurricanes for a few seasons but the feeling in our camp is positive. It is time for us to shine. The home side make some enforced changes because of injuries. James Gardner and Graeme Wilson return to the second row. In the backs Rob Impey, Joe O'Loughlen and Jashan Solanki are back involved. Locks Heath Pumas travel to the Isle of Wight to take on Ventnor in Hampshire one.